Hi all! 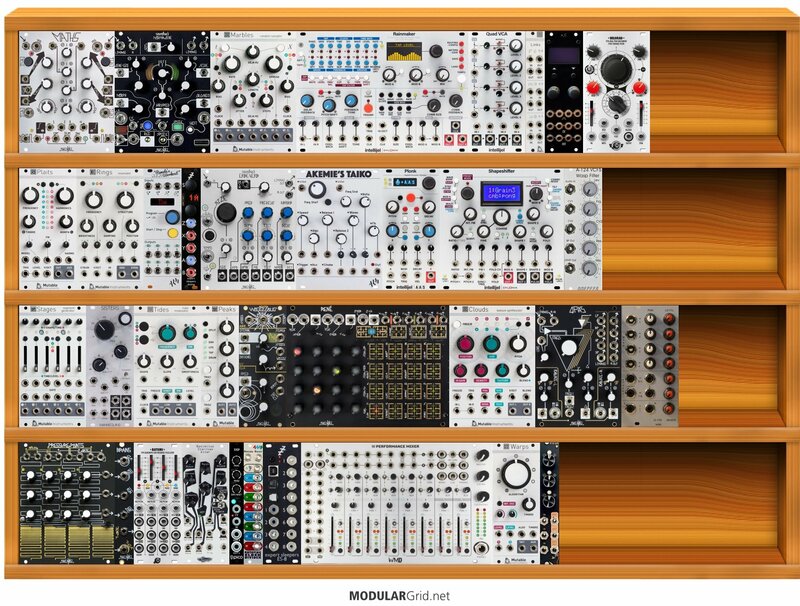 I'm about to build my first modular, in 3-4 days I will get a 6U 88hp rack and thinking about what modules to buy. I already have a Neutron and a beatstep pro which can be useful! morphagene, maths and marbles are my favourite modules and probably will start with them. What fourth module should I get in your opinion to fill these 3? I'm so excited to start this journey! It's like a week I get lost for hours in videos, forums... hope to get some suggestions! If this is an 88 hp x 2 cab, I'm assuming it's an Arturia Rackbrute. And if I'm right...you have a very sizable problem here that renders this entire build pointless: no power supply. Remove everything, start over...as the power supply should ALWAYS be the first module you drop in. Its position determines where modules that are audio-critical go, given that the safe rule of thumb says you should always keep audio-only modules away from the P/S. Secondly, if this is a first build attempt, then start with a cab that is too big, and reduce the module plan downward. You've already encountered the "why" behind this...too many modules in your head, too little space in the build. Go bigger, dump in EVERYTHING, then work backwards. Delete things, find smaller options, etc. By doing this, you'll start to see patterns of necessary module combos emerging from subsequent efforts. And note that there: "efforts". No one ever gets a build right on attempt #1. No one. If you're going to do this right, remember: this is your chance to make all of the mistakes for free because if you make mistakes with the hardware, it'll literally cost you. Calm down, slow down, and get used to the idea that, in order to get things 100% spot-on when it's time to whip out the plastic, you will spend a lot of time on Modulargrid working out what works. Remember, this works like any other musical venture...and all of those need practice. You don't start off playing Beethoven's "Hammerklavier" sonata...that's where you get to eventually, after working up to it. Creating an effective build that you'll want to use as a primary instrument for, potentially, decades requires the same degree of practice. Thanks for the reply Lugia! The case is handmade, I wasn't completely sure about getting this risk but it's half price in comparison to the arturia one and the comments were all good so I trusted him. Definitely I will go slowly, after playing with those 3/4 modules for weeks things will clear up probably... good advice to "think big" and remove module after module. I will try!